Tomorrow night, the school board will engage in a "Community Conversation" regarding over-crowding in the schools in the south end of the Everett School District. We DO have some issues, however, I don't always believe they are as dramatic or accurate as presented at times and the information seems to be constantly shifting. As you may remember, if you follow this blog, the Everett School District suffered from an historic double failure of a bond earlier this year. And, oddly, the school board based the Superintendent's 5.5% raise, in part, on the fact that they got 58% of the vote in FAVOR of the bond that failed (it required 60% to approve). So, they called a failure a success? But, I digress..... They've failed a bond in the past, but then managed to get it through the second try. But, this time, the public said, "Nope" twice in about 8 weeks to a record quarter billion dollars capital funds request (used for building and upgrading facilities, not classroom dollars). I think everyone at the brand spanking new district office was stunned by the defeat because the word is that Everett voters are called "generous" by the district. Well, the brand new district office built with money that could have been used to alleviate some of the over-crowding issues didn't sit well with the taxpayers. While the administration was crying about their over-crowded, poorly maintained and outdated facilities, they were turning a blind eye to the students being in the same. While portables at the old district office were being cried about, students were being stacked into them at some of our schools. The community failed to see the benefit of their $27 million new and oddly named, "Community Resource Center" that was never approved by the taxpayers and came at the expense of some of our schools. So, here we are. First of all, passing the bond this year wouldn't have done much for over-crowding for 3-5 years at the elementary and middle school level and up to 10 years at the high school level. Which brings me to my first question: If they knew this situation was coming, why didn't they take action before this year? Anyway, the first hour of the Special Board Meeting held tomorrow night at our district's MOST over-crowded school includes a Power Point presentation for the School Board. The next hour is an opportunity for the community to have one-on-one conversations with school board members. I went through the Power Point slides today and see some "embellishment" and over-statements that I'd like to comment on. One thing I think we have ALL learned about government agencies who want your money is that they tend to be a bit melodramatic in the presentation of their information. We learned that with the King Count Transit fiasco where voters were told that if they didn't approve a large increase for transportation that basically, it would be "Busmageddon" and the cuts to service would be MASSIVE. Well, when the voters rejected their request, the TRUTH was that there WAS enough money and not a single route was cut. So, I have picked out some slides to comment on and hope that if you're going tomorrow night that you'll at least think about what I've said and perhaps use your one-on-one conversation to seek clarification from the district. Again, I am not disputing that there is over-crowding. But, I am questioning how bad it is and whether the ONLY solution is to build new schools. Ahhhh... right for the throat right out of the gates. Yes, there IS an impact to the failure of the 2014 bond. However, don't blame the public.... I think the point about reduction of funding for teachers and classroom support is a little "bogey man". Why is there reduction? Because maintenance will have to happen now on schools they are letting go downhill because they thought they would be remodeled or replaced soon. They will actually have to fix the walkways at North Middle School - which should have been maintained all along. Sadly, though, the maintenance department is pretty skinny. The budget has been shaken down time and time again and is now over-worked and understaffed. Who needs maintenance when the taxpayers are going to give you whatever you want (until now)? And, thankfully the district is going to be forced to potentially sell unused or underused properties. Why are we mowing the lawn at the old District office location when they can't even lock the bathroom doors at the high school because the locks are all pulled off? Again, though, passing the giant bond this year wouldn't have done much to alleviate the over-crowding. 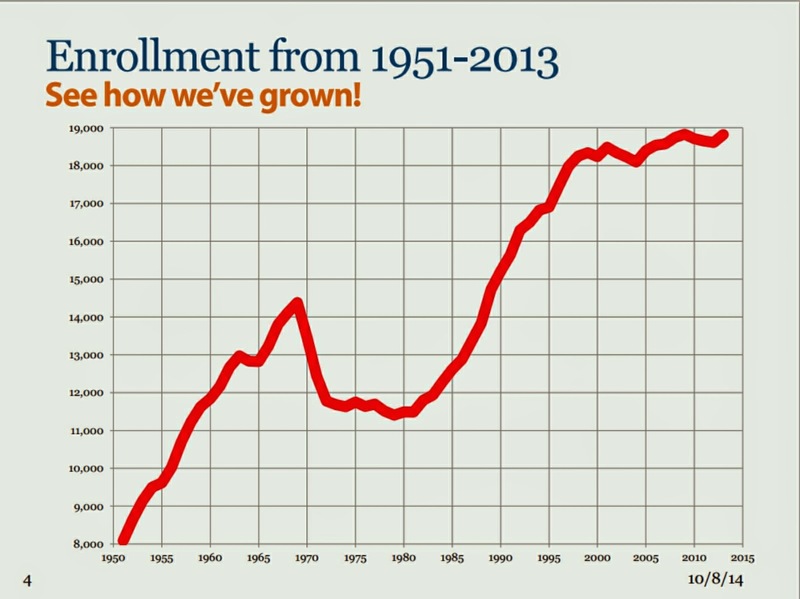 I don't think looking back to 1950 does anything but provide a dramatic red line. Look what happened in the 70's. And, if you were to do a graph just since 2000, it's been a pretty flat line. The district predicted in 1990 that there would be 20,000 students by 2000. We have never gotten to 20,000 and finally just passed 19,000 last year. We DID have a jump last year and it will probably continue to climb, but it WILL level off at a certain point - and, I believe even decline as the land in the district is finally completely built out and the demographics change. Anecdotally, in my cul du sac, we had 18 school age children when my children started school. There are now just a few high schoolers, even fewer middle schoolers and just 1 elementary school child. Most neighbors are empty nesters with kids in college and we have ONE young couple who moved in and had a baby. While there is a lot of building going on in the south end, there are also a lot of mature households without school age children. "The new high school, just north of Mill Creek, will open in 1994 with 667 students because it will serve only the ninth and 10th grades. This way, current high-school students will be allowed to graduate without changing schools. When the school is open for ninth through 12th grades in 1996, its enrollment is expected to be about 1,900, said Marijo Rymer, district spokeswoman." 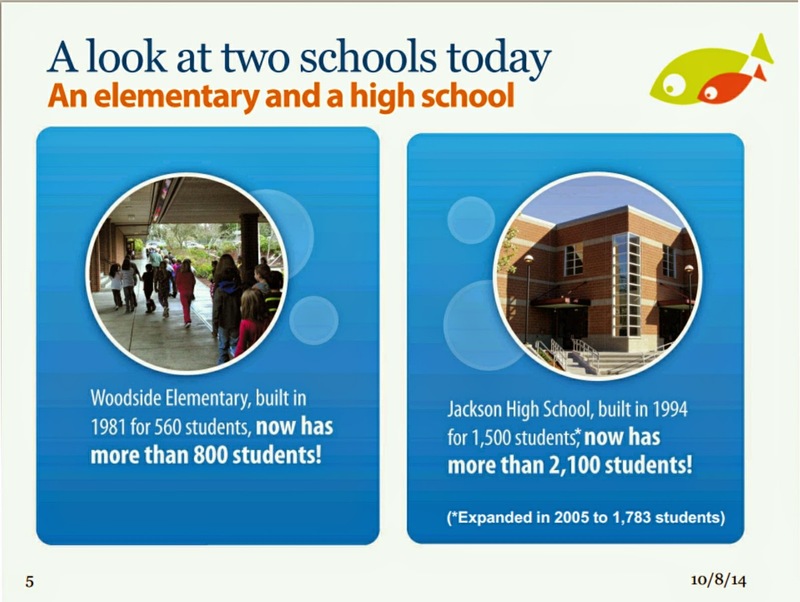 So, was Jackson REALLY built for just 1500 students? It doesn't look like it. Having 1500 students is their TARGET - it's the number they have somewhere along the line decided is the magic line that once crossed turns a high school into an over-crowded high school. No one was apparently freaking out about 1900 students in 1993 - they ASSUMED it would happen. UPDATE: I arrived at the meeting last night and was handed a pamphlet that the district seemed to use to try to refute a lot of our information. This part was amusing as it was a direct shot at us (at least use our name and give us credit.....). I'm sorry, but I didn't write the Seattle Times article, nor did the Seattle Times make up the number themselves. The district spokeswoman at the time said herself that Jackson was expected to have 1,900 students when it opened as a full high-school. Generally, just shooting the messenger is an ineffective method of refuting a claim. Saying that we "misinterpreted" is a head-scratcher since there's nothing to interpret. The statement in the article is really quite clear. Someone said, "Well, it's a 20 year-old article." Again, so what? I didn't make it up and as far as I know, 1,900 is still 1,900 even 20 years later. The headcount of 19,244 is the September headcount of all students. The October headcount, which USUALLY increases slightly over September in the past was actually 19,226. Not a huge difference, I know, but still, they lost 18 students in a month. That being said, there's something to understand about headcount; it is bodies who come through your door or programs at some point during the day and not necessarily bodies sitting in a chair from bell to bell each day. The FTE number - or Full Time Equivalent count is the one that, in my opinion, matters more. If you have a home-schooled child taking band or PE at school for just one or two periods a day, they get included in the headcount - no matter how many of them there are. But, for the purposes of FTE, it takes several of those students to make up 1 FTE - depending on how many periods or hours they are physically in your school or program. This is probably MORE relevant for upper grades, but it's STILL relevant. I haven't seen the October FTE number, yet, however, the September FTE number is 18,274 (rounded up slightly). That is a decrease of 970 students over the straight headcount. So, we have just more than 18,000 rear ends that need to have a chair from bell-to-bell each day. It's not the same 18,000 rear ends, but at some point, the equivalent of 18,000 rear ends need a place to sit. Those other kids might be at school for just a few hours or not at all as they are doing Running Start or other programs administered by the district but not necessarily at a regular school in a traditional sense. 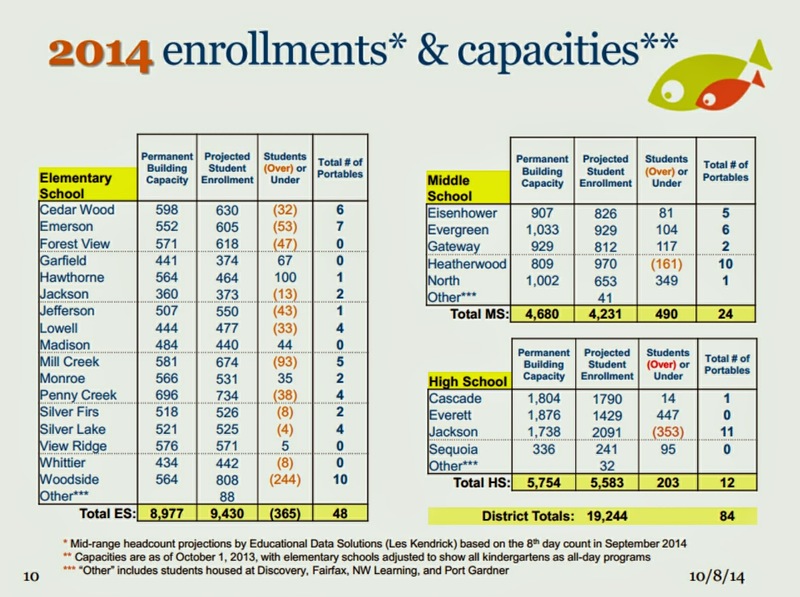 So, looking at these numbers, you see that we have a lot of elementary schools "over capacity". However, let's look at the numbers using FTE numbers and even the headcount numbers. If you take the September FTE for K-5 of 8,807, that alone tells you that the district still has FTE capacity for 170 K-5 students when compared to the capacity of 8,977. Of course, that's spread across ALL elementary schools so it's not going to help, say, Woodside. But, it's important to note that for the purposes of FULL-TIME-REARS-IN-A-CHAIR students, we are UNDER capacity districtwide. 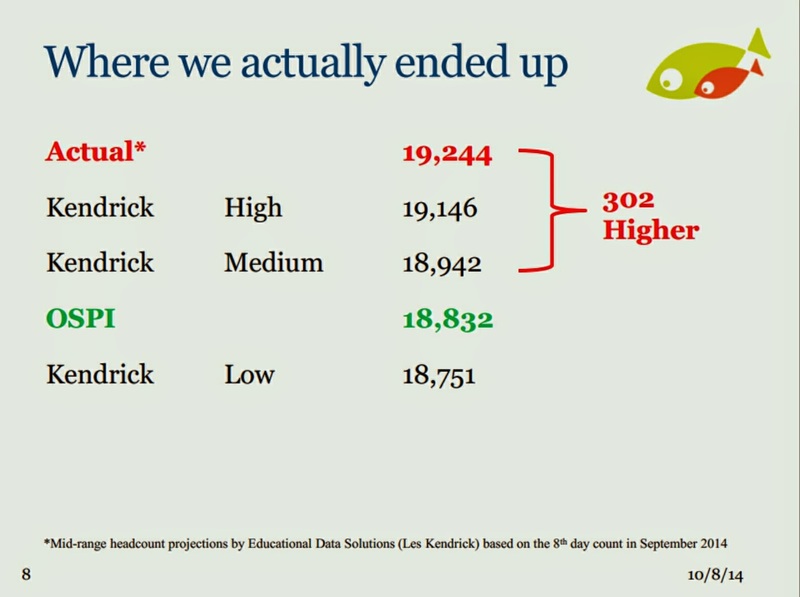 If you take the September headcount of 9,332 (the actual reported headcount, not the projected enrollment as stated on the slide) and strip out the 255 out-of-district variances, then the district is really only over capacity by 100 headcounted K-5 students across the district. Let's look at the high schools. The September headcount for 9-12 is 5,537. That alone is under the combined capacity of all high schools by 37 heads. The FTE count for September is 5,373 which is 381 full time equivalent high school students UNDER capacity. 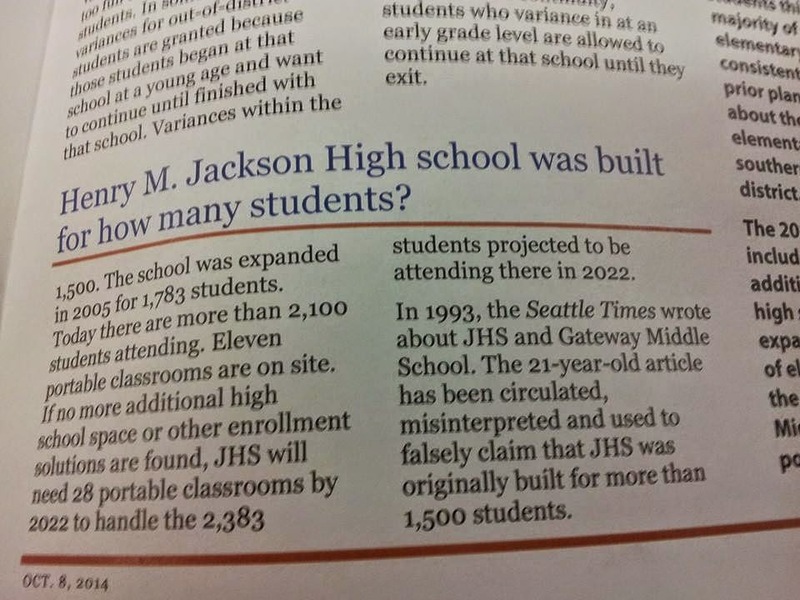 And, let's not forget that while Jackson's capacity is stated at 1,738, they expected 1,900 the first year it was used as a 4 year high school, yet it wasn't "over capacity" at that time. Let's take a quick look at in-district and out of district variance information. I'll let you do the math, but if you start limiting variances from both in and out of the district or encourage them liberally for space-available schools, you could really clean up the overcrowding at all but a couple of the elementary schools. 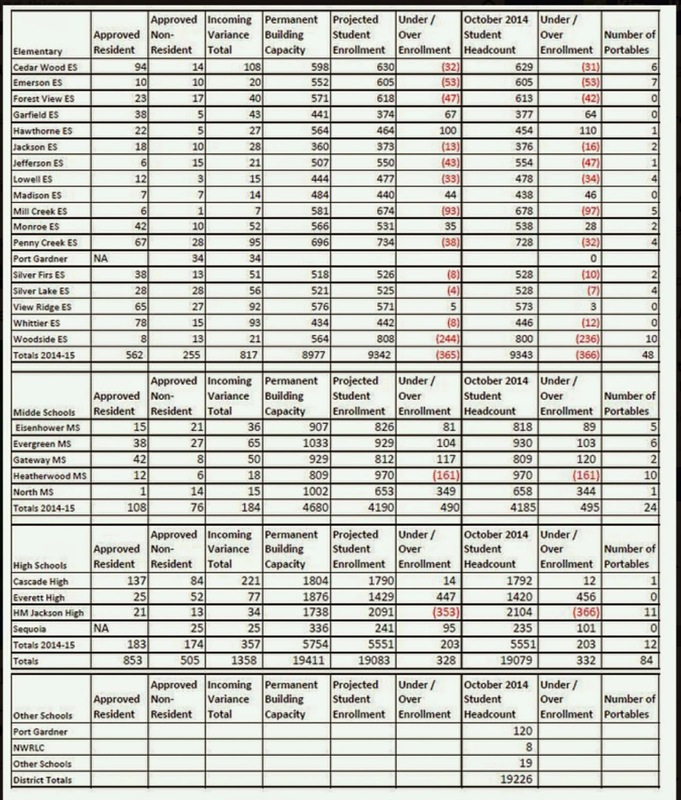 And, keep in mind, the "projected student enrollment" numbers are not accurate - they are projections. So, the actual numbers may be lower or higher. But, you get my point. Moving those rears around a bit could save the taxpayers hundreds of millions of dollars. Okay, I'll just say it. Yes, the district HAS 84 portable classrooms, but no, they are not ALL in use as classrooms right at this minute. I mean, brand new James Monroe Elementary has two of them installed still and I bet if they are being used at all, it's storage or temporary activities. This slide was particularly heavy on the melodrama. 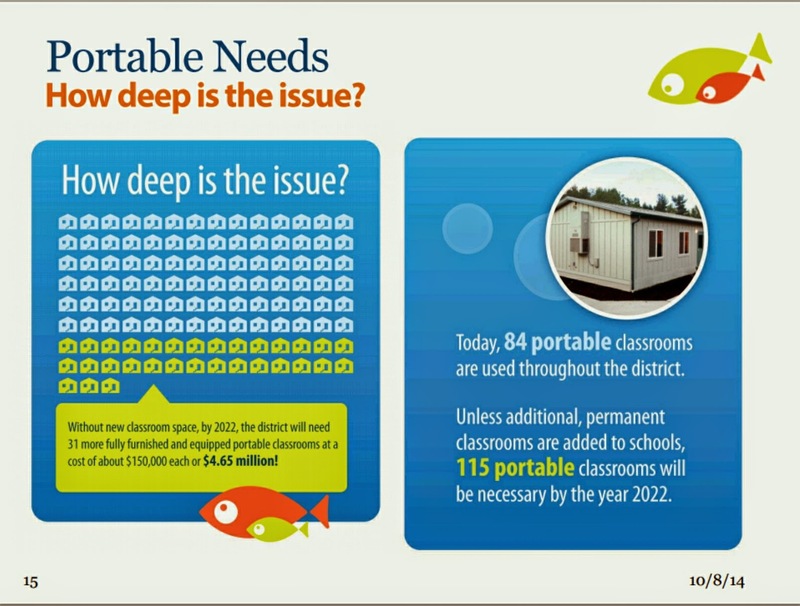 Having portables isn't the same as USING portables as a classroom. And frankly, give me 31 more portables for $4.65 million over a $259 million bond. Portables (I call it the "P Word" because everyone freaks when they hear it) are not the devil. Many teachers LIKE teaching in them because they are much quieter and students have fewer distractions. Snoqualmie Valley School District calls them movable rooms and they give the district flexibility. Read about it HERE. That being said, you CAN have too many at one school. Silver Firs had about a dozen of them on the playground before Forest View was built. At a certain point, they DO tax the common areas like bathrooms and cafeterias, but we need to stop freaking out if our child has to go to school in one It's truly a first world, 21st century problem. Kids can learn in a portable as well as they can in a permanent classroom - it's the quality of the teacher that matters, not the location of the class. APPLAUSE! This is using the old noodle! One good thing the double failure of the bond did was to force the district to be creative with the resources they have. We should ALWAYS expect that, but sadly, many larger school districts in Western Washington have become dependent on a never-ending flow of "yes" votes and have not really had to figure out anything beyond than how to spend the money. While some might go catatonic over the idea of these possible solutions, I applaud the creativity. 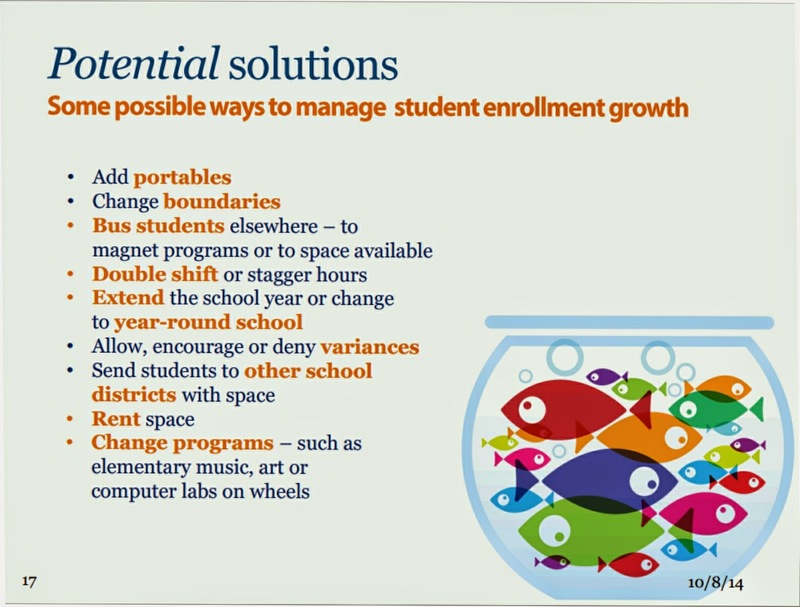 Again, none of these solutions are going to cost as much money as building three+ new schools when we really DO have capacity around the district that is roughly equal to the number of full-time students. That doesn't mean that we don't need some extra space, but even then, a little creativity applied to the situation may mean we don't need to tap the taxpayers for quite as much money. The north end of the district will probably continue to drain and with the recent remodel of some of the EHS facilities and planned remodels of North MS, we need to look for creative ways to get students into those seats rather than just building more. Throughout my life, I have lived in areas where school districts had to do one or more of these things at times. People survived and kids still learned. As a parent in this district, I live nearly on the southern edge of the Jackson/Cascade boundary. Jackson HS is not too far from my home, yet, my kids go all the way to Cascade. And, that's okay. At times I grumble and resent my many trips to the other side of town, but we're surviving and I get it. The line has to be drawn somewhere. What is the solution for the challenges we have right now? I don't entirely know. I hope the community will speak up - and not just the parents in the south end of the district because, frankly, the ENTIRE district will be tapped for money for the south end schools. Everyone needs to speak up and offer solutions. I believe the BEST solution will be one that involves BOTH building AND shifting. You will get the biggest bang for you buck that way and it will cost the fewest bucks. 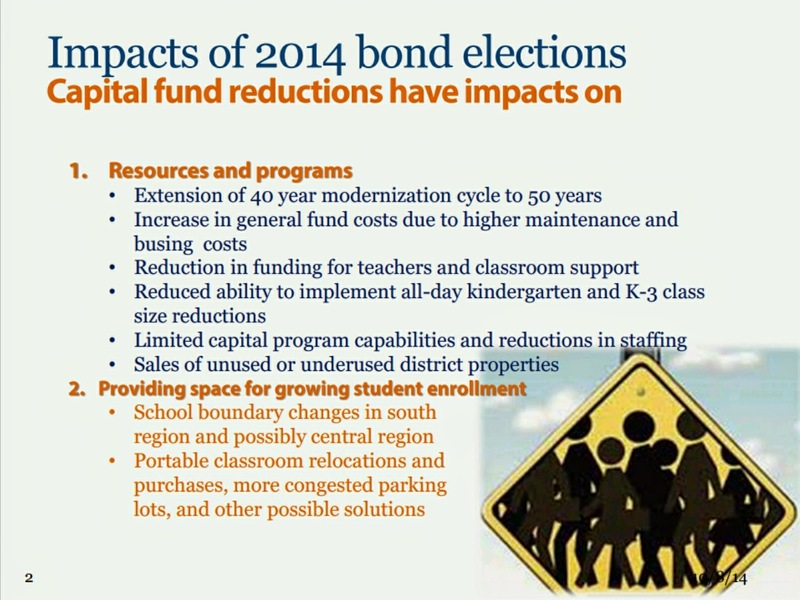 The challenge is that the district isn't happy to have to use operations funds (Levy) for what they perceive to be capital funds (bond money for building and remodeling/expanding) issues. So, busing kids from an overcrowded school to a school with space costs money that has to come from somewhere. I offer them the $660,000 bloated school board budget.... (ours is one of the highest in terms of cost per student).